The Saturday soccer league is the only full field adult soccer league in the valley. 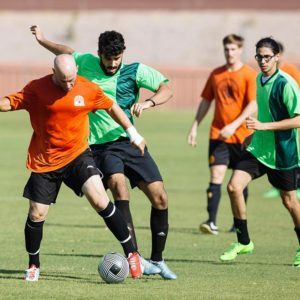 It’s the full field game which focuses on both casual and competitive adult soccer games in the east valley with the focus on Tempe, Chandler, Mesa, and Scottsdale. We do run soccer leagues in other parts of the valley and host soccer tournaments year round but our focus is in Tempe soccer leagues. We started with seven soccer teams in Mesa but now boast in excess of twenty-four teams in the Tempe soccer league. The Tempe soccer league includes the over 35 division that plays in the afternoon after the youth leagues. We will continue to grow our soccer leagues reaching down to Chandler, Gilbert, and Mesa and always welcome motivated individuals to help promote us around the valley. If you want to join in on the fun contact the league. AZ Rangers win Spring 2016 Championships! Heavy Petting Zoo win the Fall 2016 Championship! Red Rock FC win the Spring 2017 Championship! Red Rock FC win the Summer 2017 Championship! Heavy Petting Zoo win the Summer 2016 Wooden Spoon! Fuel FC win the Fall 2016 Wooden Spoon! Heavy Petting Zoo win the Spring 2017 Wooden Spoon! United FC win the Summer 2017 Wooden Spoon! United FC win the Fall 2016 Championship! United FC win the Spring 2017 Championship! AZ Fire win the Summer 2017 Championship! Sporting FC win the Fall 2016 Wooden Spoon! Liverpool win the Summer 2017 Wooden Spoon!